Raspberry Pi boards come in different types (see the following table), and you need to know about the differences so that you don’t buy the wrong one. The older models are called the A and B boards. The newer models are called the A+ and B+ boards. As of early 2015, there’s an even newer, faster, shinier, and better board called the Pi 2. This figure shows a Model B+ and a Model B. The boards are the same size, and they use the same software. But they have different numbers of connectors and other bits and pieces. The easy choice is to get a Pi 2 because the older models are out of date now. 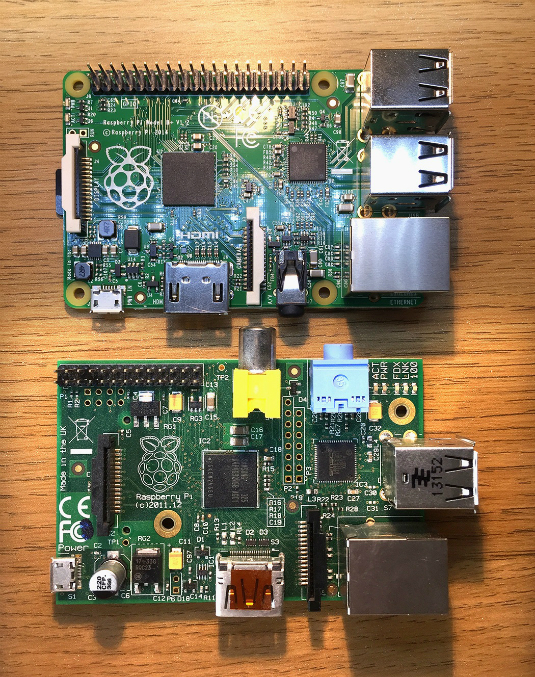 You can still buy them, but the Pi 2 is much ­better for almost everything. A Out of date now. Don’t buy one! A+ Smaller, cheaper, slower than a Pi 2. Only useful for special projects. B+ Out of date. Get a Pi 2! Pi 2 Model B You want this one. What’s the deal with the A+? It’s a cut-down budget Pi board with some important bits missing. It’s definitely not the Pi you want when you’re starting out. There is no Pi 2 Model A/A+ — at least, not yet. It’s possible the Pi people will start selling one by the end of 2015. Or maybe 2016. Or never. You’ll have to wait and see. If they do, it could be a cheaper option for finished projects. No one knows yet. And if it appears, your first Pi should still be a Pi 2 B, not an A.